Every once in a while, I stumble upon a really good idea. I featured blender brownies way back in 2014. I felt like I had found the secret to making tasty low calorie baked goods – beans. Also, I loved using my blender instead of a mixer and a bowl. I can toss my blender in the dishwasher, it is easy to pour the batter into the pan, and it mixes super fast. 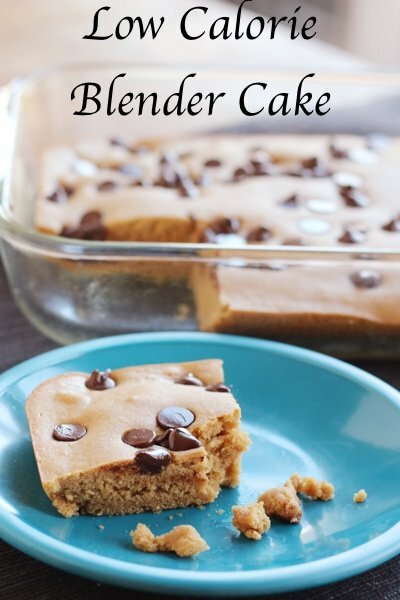 Someone commented that I should try blondies in the blender and I was all over it. 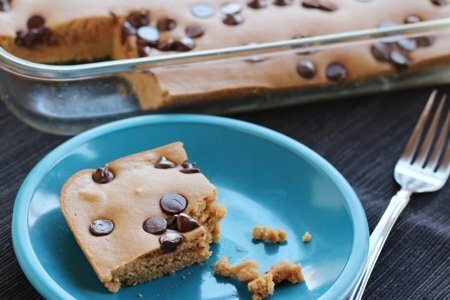 The recipe below is was an attempt at blondies that had the consistency of cake – so I decided to call it cake. I had my main taste-tester, my husband, try these and didn’t tell him about the beans. He typically wanders by when he smells something good from the oven. He said, “Very buttery,” after tasting this cake and I cracked up. No cow was touched for this recipe. Will this win the Julia Child award for best cake? Not gonna happen. Will you love it anyway? I say yes! You will make this batter faster than your oven heats up! Preheat oven to 350 F. Spray an 8x8 inch cake pan or an 11x7 glass casserole with non-stick spray. Add kidney beans, eggs, baking powder, vanilla, dark brown sugar, and flour to a blender. Blend until smooth. Pour batter into cake pan and sprinkle with chocolate chips. Bake for 20-25 minutes until baked through. Let cool, slice into 16 pieces, and enjoy! I will be trying this cake. To clean my blender, I add a tiny bit of dish soap and water, then I run it, and rinse. Even easier then the dishwasher. My husband needs to watch his sugar intake. I'm thinking I could substitute Splenda Brown Sugar Blend and get similar results? @Carol - I haven't tried it but I think it should work. Not much of a risk if it fails. Maybe a mix of half and half? Thanks for your question! Can almond flour be substituted for the whole wheat flour? @Cheryl - Yes! I definitely think that would work. Great question! I have made this a few times - quite good. I add 1/3 c. high quality cocoa powder (unsweetened, natural) for a good chocolate cake. It does get a bit dry if overcooked, so keep an eye on it. It is another one of Snack Girl's brilliant ideas! I'm curious how coconut flour and coconut sugar would turn out, I'm gluten free and do not use refined sugars. Coconut sugar swaps 1:1 with brown sugar. I loved the black bean brownies, and made some peanut butter blondies with garbanzo beans (no eggs), they were just as good. Made this with my grandson for family dinner. What a hit! No one could imagine the secret ingredient. Eager to see how it is this morning. Would be good for lunchboxes. Thank you, Lisa! Is it better than the black bean brownies? Those went into the trash. I am SO going to try these SOON and take them to a Bible Study. (My very willing Guinea Pigs.) I am really interested to try the beans in this. Is the WW flour important? Would AP flour work as well? I've tried using Splenda in other recipes but wasn't happy with the results. Give it a try you may have better results. Made it -- it was FANTASTIC. Hubs proclaimed "excellent" and it was gone in 2 days. Too funny that your husband said 'very buttery' - I'm going to have to try this one on my family - my son is not a bean fan, and loves sweets, so I would love him to get the protein without knowing it.